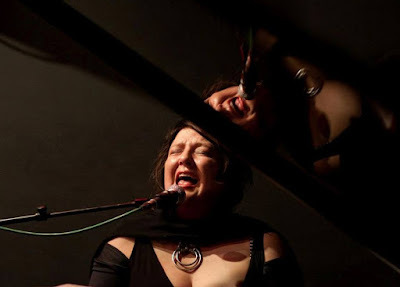 UK-born South African pianist and singerEstelle Kokot, introduced a new London-based trio with Neville Malcolm (double bass) and Winston Clifford (drums), in a performance which gathered momentum and showed fine jazz style with her songs. Kokot's Johannesburg roots are there in the way she handles her material. Deceptively easy grooves and rolling riffs with a taste of Africa underpin her work, which now includes songs from The Sound Of You, her new about-to-be-released project with Chico Freeman and Jan Pulsford. Much of the development of that work was done in South Africa with the hugely experienced rhythm section of bass player Herbie Tsoaeli and drummer Kevin Gibson. An eager crowd gathered at the Vortex on a steamy summer evening to see how the London version of the trio would fare. Kokot eased into the easy lope of See You On Sunday with some soaring vocalising, and it was immediately clear that the Malcolm/Clifford team was finding their feet very quickly. Songs from the new collection followed, with Love Dance showing one a Kokot's all-too-brief piano solos and My Story moving from atmospheric textures to momentum-filled passages which gave Clifford a chance to shine. As the evening went on, one could almost feel the band gaining cohesion and trust. We started to see glimpses of new dimensions, with Kokot's scattish vocal interjections and Clifford's extending range of textures and finger drumming providing a great backdrop. Malcolm gave the right solid-yet-bouncing bass presence, and I'd have enjoyed him getting a bit more solo space. As the ridiculously catchy Nowhere To Go But Up gave way to Sugar Rush (with a drum solo at last), the trio was gelling nicely. A final extended arrangement of Monk's Round Midnight morphing into the Miles Davis classic So What simply confirmed that this is a group with great jazz credentials, earning an well-deserved encore. For a first outing, this was a great show. It is to be hoped that these three musicians can perform together more, lean into their presence with more individual moments and stretch out. The material can surely take it and the results could be very exciting indeed.